White Russian is a hybrid Indica-dominant Marijuana strain created by crossing White Widow and AK47. Super powerful with very high THC levels (22%) and with a significant therapeutic value. White Russian is a hybrid Indica-dominant Marijuana strain created by crossing White Widow and AK47 that has received nothing more and nothing less than 7 awards in Marijuana cups. White Russian is the most Indica strain from Serious Seeds. The plant as a moderate size, it is robust and has a compact structure. 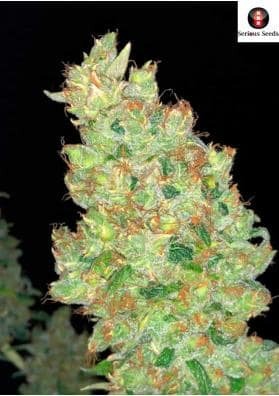 It produces dense and resinous buds that becoma completely covered with crystals from the 5th week and are the source of its name since its buds seem like snowfalls. It releases a strong smell during its entire life cycle, in this way, you should use a good ventilation system you plan to grow it indoors. After 56-63 days of flowering in a growing room it will be able to yield between 350-500g per square meter. In the outside, do the harvest in mid-late October. White Russian stands out for its impressive and super potent high. Its high THC content (22%) gives a knock-out effect, mainly cerebral, very intense and durable. For this reason, it is a plant very suitable for medicinal purposes, especially for treating anorexia.